There's nothing new to learn or to install because it uses your existing email method itself to add many useful new services. So, what did you use to make your email work hard for you today? Added @carr2n, @tcarmody, and @eringriffith to the WorthReading ccGenie Room (@mims inspired). Nominate someone. Yep, @mims idea coming alive. Articles from him, @fmanjoo, @mat, @daiwaka, @lizgannes, and @MikeIsaac so far. Thanks to @lauraelizdavis and @a_crezo for adding articles from @Reinlwapo, @annehelen, and @Elmo_Keep. 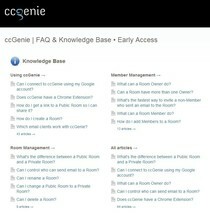 Your ccGenie Room contains content—easy to share from a single place. What's the best article you've read today? Tweet its link and tag it #ccGenie_WorthReading You may get an Invite. Thanks to @ChrisCaesar for adding @AdamWeinstein and to @recode for the @CSaid tip.